The observatories participating in the Red Dots 2017 campaign. 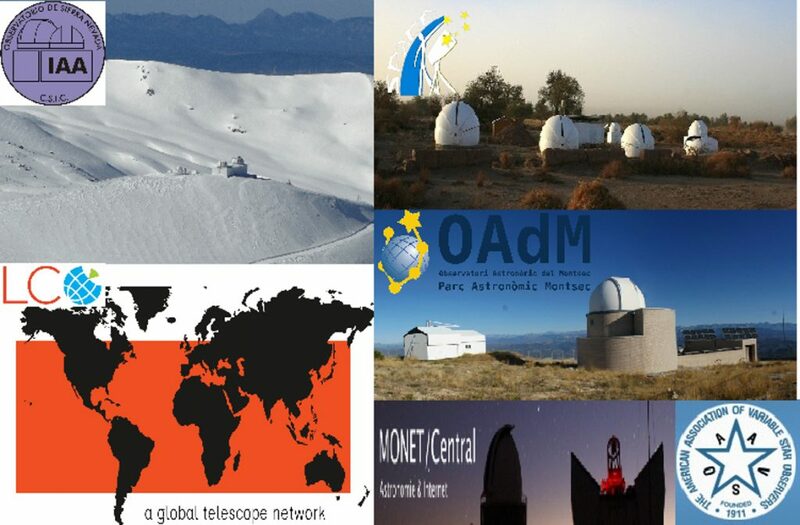 From top to bottom and left to right: SNO, SPACEOBS, the LCOGT Network, OAdM, MONET and the AVVSO. We are excited to write this first entry to the Red Dots’ photometry log! Our aim is to keep you regularly updated on the progress of the photometric observations that will take place at the same time as the main spectroscopic campaign with HARPS. All M dwarf stars, such as Proxima Cen, Barnard’s and Ross 154, suffer from stellar variability arising from different sources, that can lead to Doppler signals that may be taken for planets. Thus, a signal simultaneously present in both the Doppler and photometric data would be immediately dismissed as caused by a planet, and most likely produced by the presence of magnetic spots on the surface of the star that reveal its rotation period. Therefore, quasi simultaneous photometry will be key to assist in the interpretation of any signal detected on the radial velocities obtained with HARPS. Besides, spots, flares, and convective activity on the surface of the star are colour dependent, so photometric observations in different wavelength band passes would help in the interpretation and characterization of the variability. – The ASH2 (Astrograph for the Southern Hemisphere) robotic telescope of 0.40 m is located at SPACEOBS (San Pedro de Atacama Celestial Explorations Observatory) in Chile. It will follow-up Proxima Centauri and Ross 154 with V and R Johnson filters and Barnard’s star with narrow-band Halpha, SII and OIII filters. 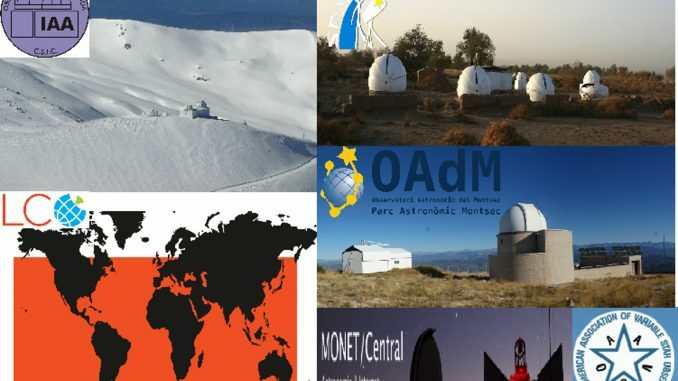 – The LCOGT (Las Cumbres Observatory Global Telescopes) Network is a non-profit organization dedicated to the advancement of science and education. We will use their 0.4 m network of telescopes spread around the world, in sites like Australia, Spain, Chile and Hawai. They will observe Proxima Cen and Barnard’s in B, V, R and I Johnson filters, and Ross 154 in R and I filters. – The 0.90 m telescope at SNO (Sierra Nevada Observatory) in Spain will follow-up Barnard’s star in B, V, R and I filters. – The TJO 0.80 m telescope at OAdM (Montsec Astronomical Observatory) in Spain will observe Barnard’s star in R and I filters and Ross 154 in V, R and I filters. – The MONET (Monitoring Network of Telescopes) North & South 1.2 m robotic telescopes in USA and South Africa, respectively, are experiencing some technical problems and will not be ready to start observations at the beginning of the campaign, although we expect them to jump in any time soon. On top of this intercontinental photometric follow-up effort, in an attempt to extend the participation in the Red Dots 2017 campaign to the largest number of people possible, we are engaging with the AAVSO (American Association of Variable Star Observers), a non-profit organization where professional and amateur astronomers contribute to scientific discovery through variable star observations. We hope to enthral you with the quest for a new planet around Proxima Centauri, and, in the case of actually discovering it, that we all share together the immense excitement and reward of scientific discovery. if there is ASH2 observing from San Pedro, does it make sense to observe the same objects with another scope (mine) close by (maybe 20m or so) also at SPACEOBS? for instructions from AVVSO on how to do and submit your observations. Thanks for your interest and clear skies! I have submitted alrady several hundreds of observations from ROAD, my private observatory close to ASH2. I was not aware of your observations at ASH2 until yesterday. All data are with the AAVSO on all the three targets. my AAVSO name is HMB. Hi Josch, Barnard and Proxima are less likely to be variable on short time-scale, but observations on Ross 154 should always help. It is a fast rotator and we might need some more detail on time-scales of a few hours to get a realistic spot model for the star. We welcome all the data of course but, for the sake of being optimal, I suggest focus on Ross 154 whenever you have spare time. Single observatory time-series covering as many nights are the most valuable ones! Thanks and we are sorry the information on the observatories involved didn’t reach you. Again, if time-series are long enough, they will all be used in the modelling of the star, so no photon will be wasted. I am following all the three stars with time series. Not in the cadence which ASH2 is doing but every clear night. I have just looked at the data I gathered so far and posted my observatins to the on the photometry log#2 page. I have a fast mount (direct drive) and cycle the stars amongst others in my nightly program. All data are sent to the AAVSO (HMB).